Interstate 75 between Napoleon Road and the Hancock County line will be restricted to one lane in each direction through the work zone for pavement repair. Work is being performed by the ODOT Allen County maintenance garage. Interstate 75 in Allen County will be impacted minimally by maintenance work on bridges and overpasses in the following locations. Work will be done primarily off the highway, but occasional lane closures may occur during daytime hours. Work is being performed by Complete General Construction, Columbus. U.S. 30 in Allen and Van Wert counties will be impacted minimally by maintenance work on bridges and overpasses in the following locations. Work will be done primarily off the highway, but occasional lane closures may occur during daytime hours. Work is being performed by Complete General Construction, Columbus. State Route 65 between Breese Road and the Auglaize County line will be restricted to one lane through the work zone for pavement crack sealing. Work is being performed by the ODOT Allen County maintenance garage. State Route 65 between Fourth Street and Elm Street, Lima, will be restricted to one lane of through traffic in each direction through the work zone for pavement resurfacing beginning Wednesday, April 24. Work is being performed by Bluffton Paving, Bluffton. State Route 117 between Greely Chapel Road and Bowman Road, Lima, will be restricted to one lane in each direction through the work zone for pavement resurfacing beginning Monday, April 22. The project also includes replacement of curbs, catch basins and crossover drainage pipes. Work is expected to continue through early June. Work is being performed by Bluffton Paving, Bluffton. 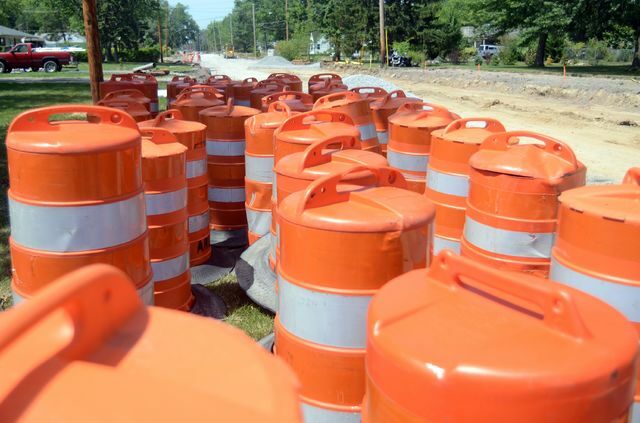 State Route 309 between the Allen County Fairgrounds and the Hardin County line will be restricted to one lane through the work zone for pavement resurfacing beginning Monday, June 3. The project also includes drainage work near the Allen County Fairgrounds. Work is being performed by Bluffton Paving, Bluffton. Interstate 75 between state Route 219 and U.S. 33, Nightly lane closures April 14th-May 31st between the hours of 6 pm and 7 am. One lane will remain open in each direction. State Route 364 between Mercer Darke County Line Road and Winner Road, bridge closure April 30th-May 20th. The official detour is state Route 705 to state Route 716 to state Route 119. Interstate 75 southbound near state Route 12, Findlay, will be temporarily stopped in short intervals overnight Wednesday, April 17, into Thursday, April 18, for the installation of a utility pole. Work is expected to be completed between midnight and 5 a.m. Work is being completed by Asphlundh Construction, Columbus. Interstate 75 northbound between state Route 613 and the Wood County line will be restricted to two lanes through the work zone for guardrail repair on Monday, April 15. Work is being performed by the ODOT District 1 roadway services department. State Route 81 just east of state Route 235, within the village of Ada, will close April 22 for approximately one week for a water line repair project. Traffic will be detoured onto state Route 235, state Route 701 and U.S. 68 back to state Route 81. Work is being performed by the village of Ada. State Route 114 between the Paulding County line and state Route 694 will be restricted to one lane through the work zone for pavement crack sealing. Work is being performed by the ODOT Putnam County maintenance garage. State Route 114 between U.S. 224 and Road M, within the village of Kalida, will be restricted to one lane through the work zone for pavement resurfacing. Work is expected to begin Monday, April 15, and continue through late July. Work is being performed by the Shelly Company, Findlay. U.S. 224 between the Van Wert County line and the eastern corporation limit of Kalida, excluding the village of Ottoville, will be restricted to one lane through the work zone for pavement resurfacing. Work is expected to begin Monday, April 15, and continue through late July. Work is being performed by the Shelly Company, Findlay. State Route 613 between the village of Leipsic and the Hancock County line, and between the Paulding County line and state Route 15, will be restricted to one lane through the work zone for removal of raised pavement markings. The work is being done in preparation for an upcoming chip seal project. Work is being performed by the ODOT Putnam County maintenance garage. Interstate 75 between county Road 25A (Piqua) and state Route 219, Nightly lane closures April 14th-May 31st between the hours of 6 pm and 7 am. One lane will remain open in each direction. State Route 706 between Johnston Slagle Road and Tawawa Maplewood Road, Road closure April 15th-19th. The official detour is state Route 235 to state Route 29 to state Route 706. Fort Loramie Swanders Road between county Road 25A (Sidney) and Thompsonschiff Road, road closure, April 22nd-May 27th. The official detour is county Road 25A to Sharp Road to Thompsonschiff Road to Ft. Loramaie Swanders Road. Interstate 75 between CR 25A (Sidney) and state Route 119, nightly lane closures April 22nd-26th between 8 pm and 10 am. One lane will remain open in each direction. State Route 66 over Flat Fork Creek, between East Hunt Street and Lima Avenue within the city of Delphos, will also be minimally impacted by bridge maintenance operations. Work will be done primarily off the highway. Work is being performed by Complete General Construction, Columbus. State Route 118 between Cooper Road and the Mercer County line, south of the city of Van Wert, will be restricted to one lane through the work zone for berm repair. Work is expected to continue through late April. Work is being performed by the ODOT Van Wert County maintenance garage. U.S. 224 between U.S. 127 and the Putnam County line, north of the city of Van Wert, will be restricted to one lane through the work zone for berm repair. Work is expected to continue through late April. Work is being performed by the ODOT Van Wert County maintenance garage. State Route 709 between state Route 118 and state Route 116, between the villages of Ohio City and Venedocia, will be restricted to one lane through the work zone for berm repair. Work is expected to continue through late April. Work is being performed by the ODOT Van Wert County maintenance garage.